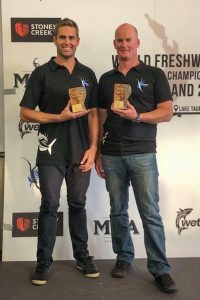 The second World Freshwater Champs is done and dusted. 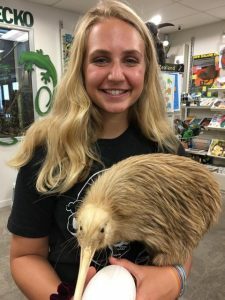 New Zealand was proud to host this new event and thank all those that participated. The Italians Gino and Mario showed their class taking second in the Masters Division, Aussie took out 3rd with Andy Ruddock and his partner Gary showing theres still life in the old bones yet! Guam came through in the Mixed pairs with a good finish in second place, congrats to brother and sister duo Michael and Monique and 3rd also taken by a Guam team of Carmela and Pat. Congrats to the USA competitors Savanah McGuire & Kathleen Cosby with a fantastic 3rd place result in the Women’s division. 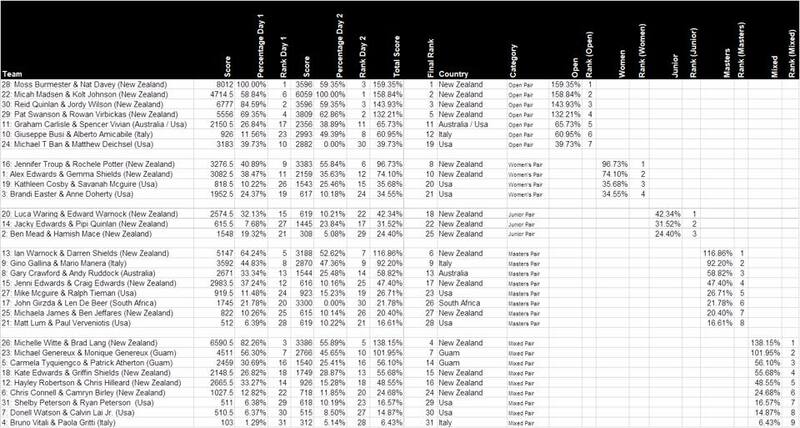 Congrats to NZ for taking out all divisions first place. A special mention to the mens and overall winners Nat Davey and Moss Burmester for a great victory. 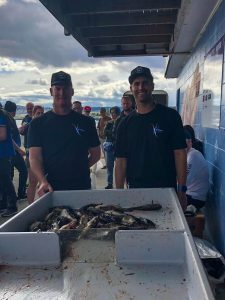 These guys took out 110 Catfsh for the two days, very closely followed by Kolt Johnson and Micah of NZ with Reid Quinlan and Jordy Wilson showing their consistent class. To all the other division winners congrats and well done, there are a few personnel stories that make it all the more special. 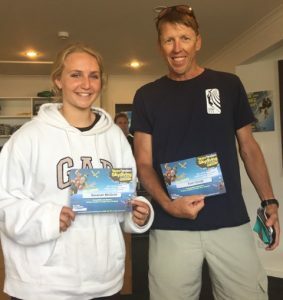 Well done to Jennifer Troup and Rochele Potter Womans, Michelle Witte and Brad Lang Mixed pairs, Ed Warnock and Luca Waring Juniors and Ian Warnock and his partner for Masters Division. To all the other place getters well done, it was a tough comp. To our our sponsors, Stoney Creek, Moa Beer and Wettie thanks. 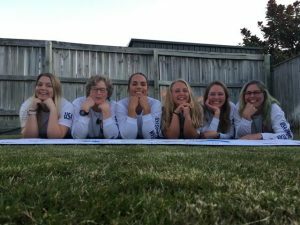 Also the people in Taupo that helped out especially Brenda from DOC, a big thanks. Bring on 2021 the options are looking exciting. The USA sent 15 of our top divers to complete in the 2nd World Freshwater Spearfishing Champion. 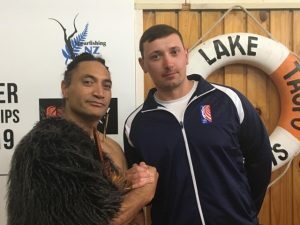 This event was set in the middle of the North Island in Lake Taupo and Hosted by Darren Shields and Wettie. 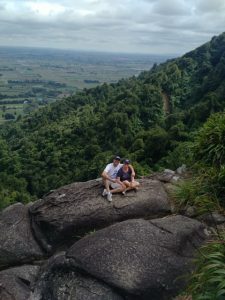 Having a great host, in a great country, with such friendly people made the whole trip a SUPER success. 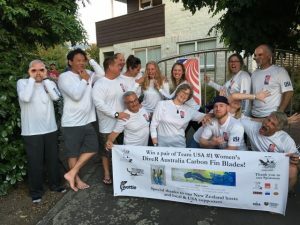 The USA team had divers from Hawaii, Ca, Co, Ut and Conn. We were a fun organized team that came for the competition but also to enjoy the New Zealand for all it had to offer, and we really did. 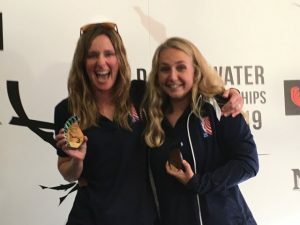 The USA team gave it our all and ended up with many fourth, fifth and sixth places, our top performance was third place taken by Cathy Cosby and Savanah McGuire in the women’s division. Smallest catfish won by Ryan Peterson of Utah. The meetings, dinners, parties, ceremonies, and camaraderie that led up to this two day event was so much fun. The event lasted two days and finished with a great dinner and awards ceremony. Fun was had by all and the friends and memories will last forever. The event had seven countries and 62 competitors in five divisions. 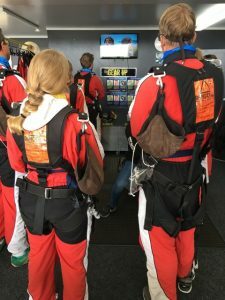 It was very well managed and run from the start to finish. A big thanks to Long John and Reid for keeping us tuned up. 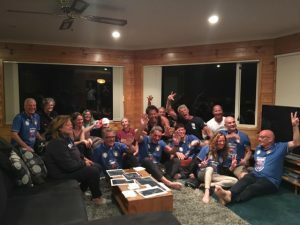 Italy sent 6 divers and 4 additional support members that included past champions presidents, and committee members. 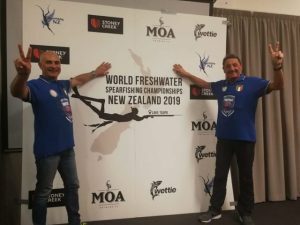 As Italy has a big Freshwater contention we hope to see World event there soon. 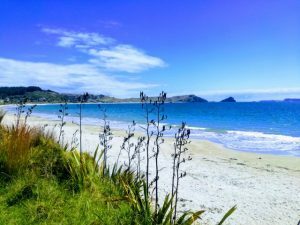 Most of us got to explore and experience New Zealand for a few days before the event , but many of us spent an extra 2 weeks there. So many great memories from this trip. Started the trip out right with a curry chicken pie and a shopping trip at Wettie for wetsuit and weights. 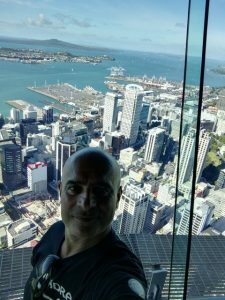 From there, up to Whangaparaoa to dive with Paul Spence, who kindly hosted a few US Team divers for a few days. 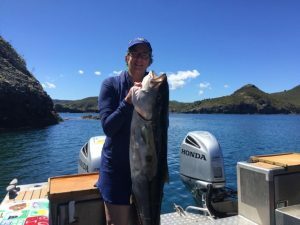 We dove for kingfish, snapper, crayfish and more, and brought home enough fish to feed the house each night, as well as fish to take to Taupo. 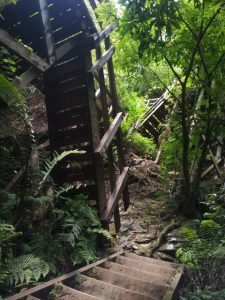 Highlights: Spencer’s behemoth kingie, diving for mussels, an afternoon hike on Tiri Tiri Matangi (an island preserve), and a run out to Great Barrier Island. Each night Paul and Sandy hosted us and other friends and family for big meals of fresh seafood. Diving full days means you need a fair amount of calories to wake up and do it all again the next day. Luckily New Zealand food, whether from the ocean, a family kitchen or a bakery, is insanely good. Everything I ate on this trip was fresh, colorful, delicious, sweet, savory, innovatively cooked, or all of the above. Diving the Lake Taupo competition was like no other diving I’ve ever done. 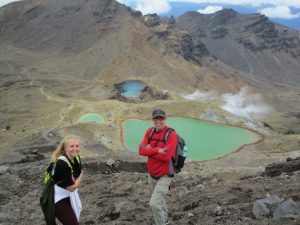 For starters, Taupo has a lot of thermal activity, from steamy pools of water on the banks of the lake, to gas bubbling from the bottom of the lake in some spots. 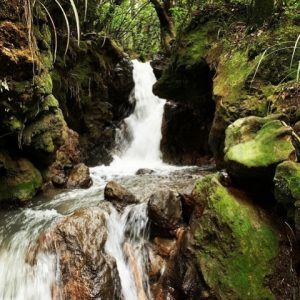 Near the rivermouths, giant rainbow trout cruised fearlessly past us. On the bottom, we’d occasionally spot electric-blue koura (a freshwater crayfish). Popping up after a dive involved not swell and wind and kelp and currents and tides, but brilliant blue skies, a gentle breeze, black swans drifting around with lines of grey cygnets following them, and a ring of mountains around the lake, some of them steaming like tea kettles in the distance. Scouting involved long days teaching our brains to look for new, different, and more subtle patterns of habitat, and fish. We swam and scouted miles of the competition zone, building our teamwork and communication in addition to figuring out where the fish were and were not. At first everything looked the same: sand, weeds, water and mud. Maybe some pebble patches, pumice boulders (which look heavy but practically float) a fish here or there but never in great numbers. While it was frustrating to not find the fish as easily as we’d hoped, Savanah and I still had so much fun each day. It was such a thrill to be in New Zealand, diving in a surreal volcanic freshwater lake, learning from scratch everything we could in a limited amount of time, learning to work with our gear and with each other, making decisions on where to dive. At night we’d eat with our team-mates and new friends, trading notes and stories. 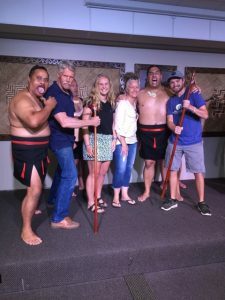 The divers’ meeting a few days before the comp opened with a memorable welcome from the local Maori people. On dive day 1, we dove 3 different spots and didn’t bring in many fish, but learned a tremendous amount and felt we’d worked well together with a pole spear, a gun and our various floats and lines. We decided for day 2 to simply apply as much as we could that we’d figured out the first day, double our take of fish, and have fun. We started day 2 with much cooler, overcast weather, which meant low light and low contrast on the bottom. It definitely made hunting more challenging. 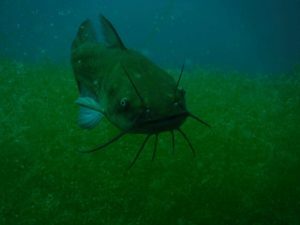 The fish must not have liked that weather either – almost every single fish on our second day was holed up in the weeds or pressed sideways or face-first into soft muddy ledges at the edge of sand patches. 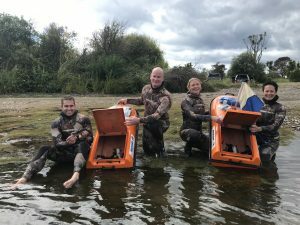 We worked hard to bring in as many fish as we could, and were happy to help clear our share of catfish out of Lake Taupo. We spent all of day 2 in one spot, and doubled our take of fish from the day before. The best part of the whole trip wasn’t the diving, it was the people. So good to meet new friends, and an honor to compete against accomplished divers from New Zealand and beyond. Cheers and hope to see you all in Beaver Lake, Arkansas Aug 6-7 for Nationals, then again for WFSC in 2021 in Aug. 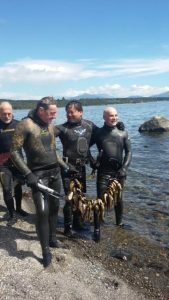 The Spearfishing Championship took place at Taupo lake, a volcanic one, in New Zealand the 9th and 10th of March. The competition involved just the catfish due to the fact that it’s festering fish because it eats the eggs of the others spices. It lasted two day: in the first one we took 36 fishes and in the second 28 gaining the second position in our category. 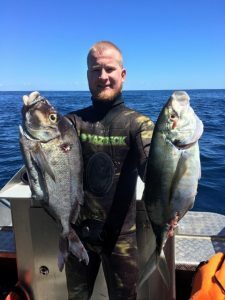 Something really strange was their way of fishing: spearfishing. And that was our difficulty because we always use the rifle, even during the competition. We were proud for our result (because we didn’t use their equipment) and especially for the warm reception from all the teams and even the American ambassador wanted our t-shirt as a gift. 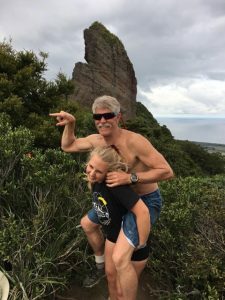 During our stay we visited all the city and we rented a camper in order to fish in the ocean. 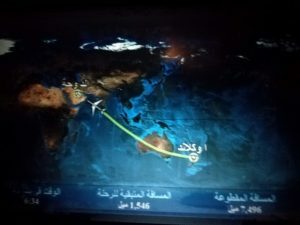 Since I was a child I always wished to visit the other part of the world and this completion has been the opportunity to realize it and to meet people from different part of the world with same passion of mine and with them we created a very strong friendship and we still keep in contact. I will be the first registered for your competition in Arkansas! See you soon, a kiss to everybody. 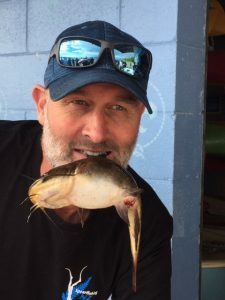 n New Zealand we have a competition called the Catfish cull that is a fun comp that allows the competitors of all ages to go out and kill as many Catfish as you possibly can in a area of our biggest lake. The first year I competed in in the cull (2018) was the first year in the history of the cull the fishing had been hard, only a quarter of the normal catch per team as normal. At the prize giving Moss and myself came in forth only 4 fish behind the winning pair, we where happy with that as it was only my first time chasing these small fish. 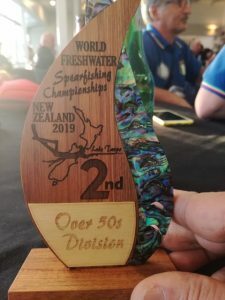 At the end of the prize giving there was an announcement that the results from this comp would be added to the 2019 comp results and ranked to make the team for the World freshwater champs to be held here in March 2019. Cool now we had a goal for next year, to do well and make the team. February 2019 comes around and Moss and myself swam hard and learned a lot and came in forth again. 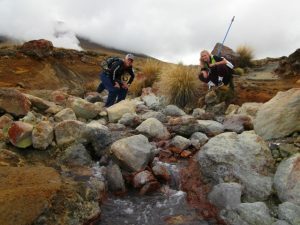 We where stoked we had qualified for the NZ team. 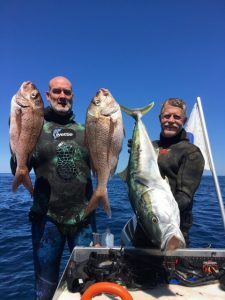 March 2019, we turned up a couple of days before the comp and where told the area, which was the same area as we had just dived a month beforehand but smaller. Great for us as we knew the area so scouting wasn’t full on. We saw a few fish but knew it was going to be hard going. The day before the comp we got to meet the other competitors, great to see so many from overseas. 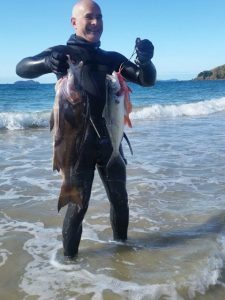 On the first day of the comp Moss and myself where standing on the foreshore and came up with a plan, swim further than anyone else and we should be able to shoot more fish than anyone else. Big plan but doable. It was a long 6 hours in the water and around 8 to 10kms swam and nearly 200dives each we ended up with 78 Catfish in the float boat. At the weigh in we where over the moon to be leading and leading well. 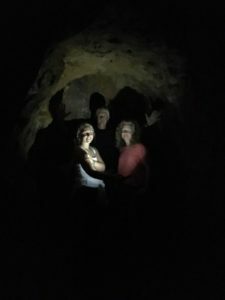 We knew the second day was going to be hard as it was the same area. 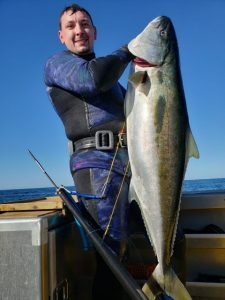 We knew that some divers weren’t even going to shoot a fish on the second day with that decision, so we where going to have to dive harder and swim further than the first day and get very lucky. Day 2, fishing was hard, very very hard and boy did we swim. We got 35 fish that day and came in third we where happy but one team had a very good day and nearly caught us in the end. It only came down to one fish in the end. We where very proud to take the title home. 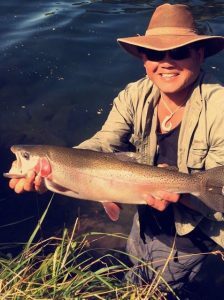 It was great to see so many overseas competitors come over to New Zealand and push us hard to chase a small little fish. We look forward to bringing the title over with us for the next World Champs in 2021, Beaver Lake Arkansas.